Councilmembers will conduct a second hearing for an ordinance providing for retail gas pump security measures and approve a ranking of consultants for branding and roadway monument signage at their meeting at 9:30 a.m., November 7. In addition, they will hold workshops addressing Estero Parkway roadway and sidewalks, and Estero River maintenance. 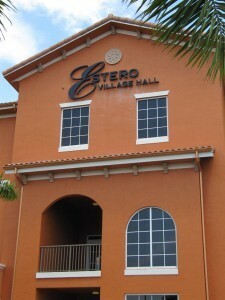 Council meetings are held at the Village Hall at 9401 Corkscrew Palms Circle, adjacent to the entrance to the Estero Community Park.